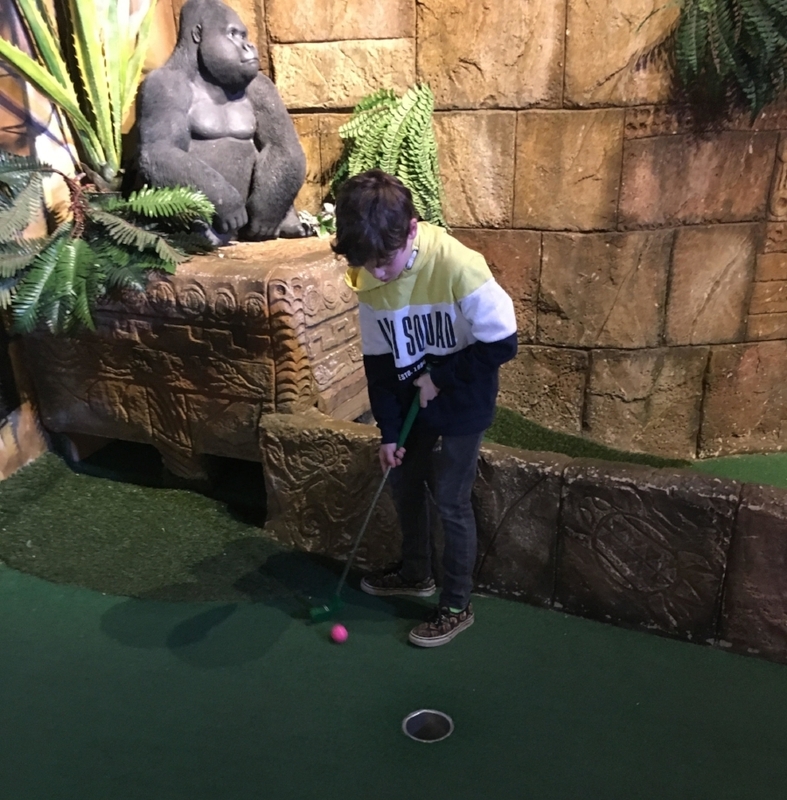 This week we visited Mr Mulligan's Lost World Golf in Cheltenham, an indoor activity great for a rainy day. Mr Mulligan's only opened in October 2017, so is a fresh and exciting day out for the children. 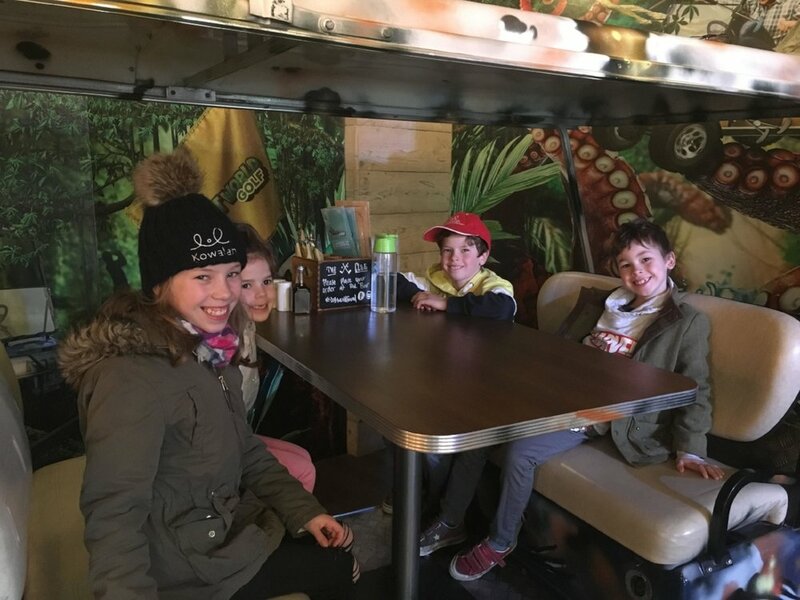 Our reviewers today are Matilda (10), Monty, (8), Herbie (8) and Dixie (6) who were chaperoned by Kowalah Emily. "When we walked in the door there was a time machine! I think it was actually a lift! We walked up the stairs past lots of ancient artefacts like plates and jewellery. It was cool" says Matilda. "We had lunch first - I had chicken goujons. They came on a wooden board instead of a plate. I also had the BIGGEST bowl of cheesy chips. You could eat your meal in a golf cart so we took some pictures." "It was massive! The windows were very dark so it looked creepy!" says Monty. Tell us about the golf! Matilda starts, "We got given our golf clubs - they are called putters. I got a green one and my little sister got a purple one which was smaller. You choose your ball as well - I got a green one and my sister got an orange one." "Then we started golf. Dixie went first." "I had to hit the ball into the hole with the littlest number of shots as I could" says Dixie. "Emily told me that I had to get my feet in line with the hole to make it easier. I kept forgetting. Hole number 10 was the hardest. It had a lot of corners!" Dixie continues, "They had two courses - we did a jungle one. All of the holes had funny animals like gorillas, tigers, a big cobra and even a dinosaur. There were three holes in a luminous room. All of our golf balls lit up really bright!" Matilda adds, "The golf was quite hard - we had a rule that if you hit more than six shots then that was all you were allowed. We got quite competitive!" "I liked hole 14 in the luminous room. I can't believe my six year old sister beat me! The boys didn't do so well as they kept hitting the ball too hard!" Herbie defends himself, "The course was hard because there were corners. You had to hit the ball through a loop the loop. I did it. Emily took loads of tries." Monty supports him, "It was quite hard because the holes were far away and the golf clubs were quite heavy and not easy to hold. Some holes took me 4 shots, but on some I took 6." "My favourite hole was the one with a loop the loop." agrees Monty. "My favourite hole was the first one because it was the easiest!" says Dixie. Matilda says "It works quite well going after the cinema as it is right next door." Herbie provides constructive advice - "Don't hit your leg!" Monty suggests you "practice before you hit the ball. Hit it softer than you think you should. Except on 18 when you can smack it hard." "I would like to go again," says Matilda, "but I would like to do the harder course - the holes looked quite difficult with more obstacles." "I'd love to go again," says Monty, "at the beginning it was quite hard but by the end we got the hang of it, so I would like to try the harder course next time." Herbie would love to go again, "I would eat at the restaurant again, it was the biggest bowl of olives I have ever seen." and Dixie also loved the meal "the chips came in my own special metal basket." Mr Mulligan's was easily booked online via their website. You can choose whether to play just one course or both. We think just one is enough with young kids - by the end of 18 holes minds start to wander and clubs get left behind. You book a start time (in 30 minute windows) and check yourself in at the front desk to begin. You'll be given putters that are the right high for each child, a score card and a pencil to decide who wins. A single game costs £6.75 for under 12s and £8.75 for your Kowalah. You can get a family pass for 4 people for £27. Mr Mulligan's is situated in the lively Brewery Quarter in Cheltenham, so depending on how much time you have you can tie your visit in with a trip to the cinema or some bowling.